According to Pierre Teilhard de Chardin, “Love is the most universal, formidable and mysterious of cosmic energies,” “the very blood stream of spiritual evolution” (Teilhard, Building the Earth, 45, 49). Its ultimate aim is the great work of union, a desire that pervades the entire cosmos. Those who fall in love participate in an adventure that began about 14 billion years ago. They enter into a relationship that will survive and flourish only if they embrace a life of perpetual discovery and strive to surmount the obstacles to greater growth that are sure to assail them. Teilhard experienced the many levels and aspects of love. At an early age, he fell in love with rocks and the beauty of Earth’s landscape. Later, he came to know the power of interpersonal love and the struggle that it entailed. Finally, his view of love became cosmic, with roots that extend to the very beginning of time and with strands that run through the entire epic of evolution. In the early universe, the thrust toward union manifested itself in the forces that fused hydrogen into helium, that created atoms from nuclei and electrons, and that gathered into galaxies the gas and dust scattered throughout the early universe. With the coming of life, the energy of love surfaced gradually as a more spiritual force of attraction that consistently urged the cosmos toward its single ultimate goal—union. A thrust toward union is coded into the very fabric of the cosmos. Teilhard called this pattern Creative Union, a term that implies a coming together that not only unites but also differentiates. Creative Union characterizes all sorts of unions: physical, chemical, gravitational, biological, and spiritual. Whenever two or more truly become one, each entity becomes richer and the group becomes capable of more. Teilhard extrapolated this pattern of ever more complex unification into the future predicting that the universe will eventually converge into an omega point, a point at which a maximum of diversity and complexity can coexist in a spirit of creativity. The principle of Creative Union is also operative in the collective thinking layer surrounding Earth’s biosphere that Teilhard called the noosphere. The internet, which in our day facilitates a global sharing of information, thoughts, and ideas, gives us a sense of the potential of this interconnected sphere of human consciousness for great good as well as for great evil. To discern the best use of the resources available to the global community, the noosphere, like the human body, needs a heart and a soul, a common passion and sense of solidarity. However, humanity has not yet learned to release the formidable energy that lies dormant within its conscious layer. Instead, many feel hopeless. Today our media tends to focus attention on disasters and bombards us with images that incite fear and anxiety, giving the impression that our world is headed for destruction. Fewer are the stories of every day magnanimity and courage, of unity and love. Teilhard understood this dilemma and tried to show instead that, because we live in an unfinished universe, the task of making our world whole is an ongoing human project. Not interested in simply surviving, he envisions instead a day when humanity will overcome the animosities that drive us apart, a day when we will become more deeply conscious, more fully alive, and truly creative, a day when each of us will stretch out our arms to embrace the whole world so that together we can call down the fire of love. What we need above all else is a common passion. But how do we dare to commit ourselves to such a vision, especially given the pressures, uprisings, and mistrust that persist in every corner of the world? Teilhard points to the great religions as a deep source of spiritual wisdom and inspiration. Only a dynamic spirituality oriented toward the future can keep us animated, strengthened, filled with zest for life, and capable of sustaining interest in this worthwhile but difficult task. As Teilhard pondered the global situation, in light of the creative cosmic process, he came to identify the omega point of evolution with the God of the future who draws all things to himself in a loving embrace. He also imaged the urge towards union that is embedded in the cosmos as a divine presence, not unlike Sophia, the Wisdom figure of scripture—Sophia, who from the beginning has been encouraging the fragments of matter to overcome repulsion, to come together, and to create something new. Now she plays over the surface of the world, gathers us together, and leads us to the Cosmic Christ, the true Omega Point, in whom we come to realize that we are already one. These manifestations of sacred presence and loving allurement made tangible for Teilhard the mind, the face, and heart of a God whom he could love, a God large enough to embrace the entire world, a God who would lead humanity into a future full of hope. Perhaps it was Teilhard’s intuition about the science of non-linear dynamics, or chaos theory as it is popularly called, that helped him to discover the principles of Creative Union. This relatively new branch of science has much to teach us about the way change happens in our world. Scientists assure us that a certain amount of instability is important for growth-filled change. Nothing happens when a system is in equilibrium. Teilhard somehow realized this and looked at the tensions of his day as an opportunity to stir up the enthusiasm and courage needed to address creatively the problems that beset the human family and Earth, our common home. Some basic principles direct those who wish to participate in the great work of Creative Union. For the human family to flourish and not simply to survive, our love must reach around the globe to all persons of whatever persuasion. It must extend to our Earth, to our ancestors who have brought us to this moment, and to our children of the future. 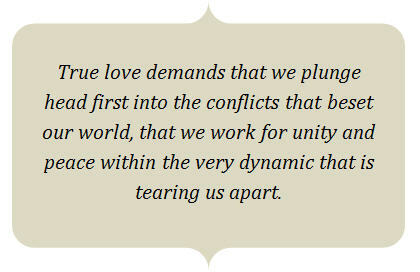 True love demands that we plunge head first into the conflicts that beset our world, that we work for unity and peace within the very dynamic that is tearing us apart. A multitude of actions become available to us once we commit ourselves to a hopeful vision of the future. First, though, we need to develop a common vision, a new global consciousness that will allow us to imagine a world where our energy goes into collaboration and creativity rather than violence and war. Whether or not we agree with him, Teilhard remains totally optimistic. He knows that Omega, the Cosmic Christ, is drawing us on and that Wisdom Sophia is there to support and encourage our efforts. With great trust in the divine presence in our midst, he looks forward to the day “when, after harnessing the ether, the winds, the tides, [and] gravitation, we shall harness for God the energies of love. And, on that day, for the second time in the history of the world, [humanity] will have discovered fire” (Teilhard, Toward the Future, 86-87). A thrust toward union is coded into the very fabric of the cosmos. Teilhard called this pattern Creative Union, a term that implies a coming together that not only unites but also differentiates. Teilhard tried to show that, because we live in an unfinished universe, the task of making our world whole is an ongoing human project. What we need above all else is a common passion. But how do we dare to commit ourselves to such a vision, especially given the pressures, uprisings, and mistrust that persist in every corner of the world? Ponder this perspective. How is it that real love causes “ union to differentiate”? How do you see this truth in your own relationships? How does this scientific perspective change the way you view the instability in your own life, and the instability in our world? If what we need today is a “common passion” as Kathleen urges, how does our own consumption of a fear-based media perpetuate anxiety? Conversely, how can we begin to contribute to a new common passion by participating in that which promotes unity? Robert – Hildegard of Bingen saw each part of her monastery as part of the whole: whether in the kitchen, the garden, her cell or the basement, every room was the room of life. In the same way, leaving Lake Erie to go to a new destination is changing place but not space. The scenery will be different but the room is one. Dear Dr. Duffy, Thank You for a wonderful article. This idea of union and differentiation strikes me as important for our time, and reminds me of John 1:1. 1) Individual. “In the beginning was the Word.” God creates us to strive to be the fullest people we can be. We celebrate our uniqueness, our individuality. We learn to stand, to be our true self. 2) Community, Relationship. “And the Word was with God.” There is an “I and Thou” relationship. We recognize and celebrate the Other. We are all attracted to each other and community (a bit like physical gravity). 3) Total Union, non-duality. “And the Word was God.” The individual person and community merge entirely with God. There are moments when we don’t know where we end and the other begins. The fire of Love, complete union. Perhaps we are meant to move between these states, and at times to experience these states at once.